In this hysterical satire of Reagan-era values, written and directed by Albert Brooks, a successful Los Angeles advertising executive (Brooks) and his wife (Julie Hagerty) decide to quit their jobs, buy a Winnebago, and follow their Easy Rider fantasies of freedom and the open road. When a stop in Las Vegas nearly derails their plans, they’re forced to come to terms with their own limitations and those of the American dream. Brooks’s barbed wit and confident direction drive Lost in America, a high point in the string of restless comedies about insecure characters searching for satisfaction in the modern world that established his unique comic voice and transformed the art of observational humor. Who hasn't fantasized about "dropping out" from the hustle and bustle of society every now and then? Quitting your job, hitting the road, and living a simpler life free from the pressures of the daily grind can often seem like an enticing alternative to the emptiness of a superficial routine. But what happens when that idealized dream becomes an ironic nightmare? Well, something a lot like Albert Brooks' Lost in America. An amusing satire about materialistic desires, stagnation, and the frustrating consequences that come from leaving your comfort zone, the film examines what happens when expectations meet reality and you trade in a Mercedes for a Winnebago. 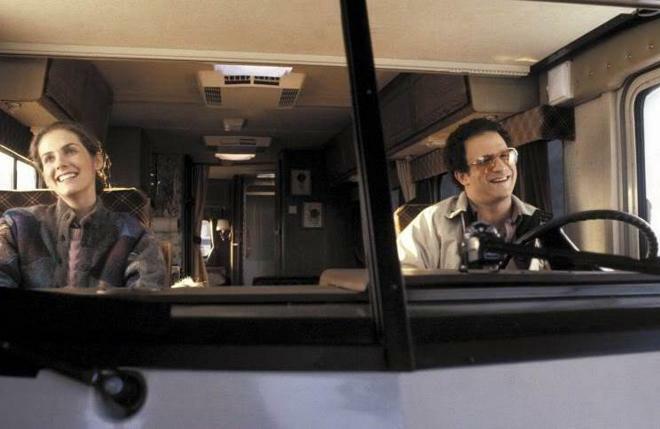 After quitting their jobs, selling their home, and cashing in their savings, David (Albert Brooks) and Linda (Julie Hagerty) buy an RV to travel the country in hopes of escaping the burdens and monotony of a traditional lifestyle. But when the married couple's nest egg is put into jeopardy, their dream of a simple life on the road begins to crumble. As they start to long for the salaries, stability, and luxury cars they left behind, the pair must decide whether to rough it out or crawl back to their old lives. Conceived as a yuppie spin on Easy Rider, the narrative forms a satirical look at the concept of "dropping out." To this end, much of the comedy stems from the couple's increasing realization that they might be a little in over their heads, leading to a few amusing fish-out-of-water moments as they're forced to struggle to get by. Likewise, Brooks' trademark penchant for sarcastic quips and hilarious rants ends up fueling most of the flick's funniest moments, juxtaposing his default uptight demeanor against the free spirit he's seemingly aspiring to be. 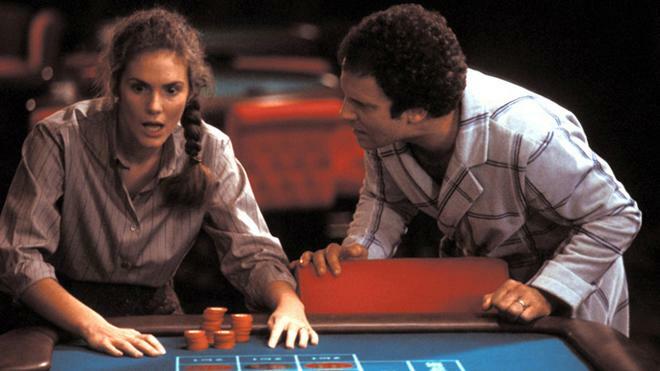 Hagerty also earns some good laughs herself, especially during her infamous gambling scene, and the pair do a great job of playing off each other. Likewise, though their plight is mostly milked for comedy, the actors bring a believable sense of yearning, frustration, and desperation to their performances. 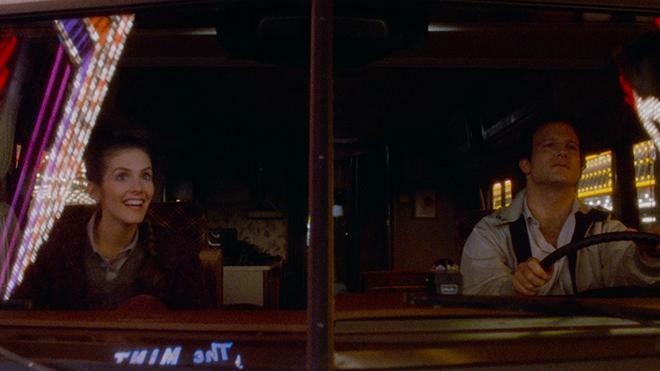 Beneath the hilariously biting jabs and comically frantic squirming, the script deals with some thoughtful ideas related to the quest for ever-elusive happiness in modern America, all while filtering its commentary through an effectively sardonic road trip. But unlike many contemporary comedies, Brooks allows the humor to develop at a more leisurely pace here, often holding on takes to let scenes build comedic momentum without interruption. Likewise, certain bits seem to be almost intentionally drawn out to maximize their cringe-worthiness, including an extended conversation between David and a Casino manager (played by a hilariously fed-up Garry Marshall) where he desperately attempts to save his nest egg. Coupled with the script's clever observations, this more deliberate style helps to create a genuine voice -- something that's far too often missing from many recent assembly line studio efforts. Through witty farce, Lost in America asks where true happiness and fulfillment come from. Does actual success stem from a new promotion? A bigger house? A few more credit cards? Or is the real source of contentment something far more difficult and rewarding to attain… like genuine leather in a Mercedes! As the flick reveals, not everyone may be cut out for a free-spirited life on the road, but that doesn't make it any less entertaining to watch them try. 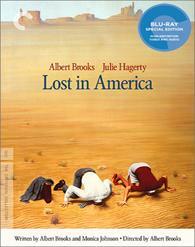 Criterion presents Lost in America in their standard clear case with spine number 887. The BD-50 Region A disc comes packaged with a pamphlet featuring an essay by critic Scott Tobias. The movie is provided with a 1080p/AVC MPEG-4 transfer in the 1.85:1 aspect ratio. Sourced from a new 2K restoration scanned from a 35mm interpositive made from the original camera negative, this director supervised video looks quite nice, retaining a natural filmic appearance. The source is in great shape with no notable signs of age or damage. A moderate to heavy layer of grain is visible throughout, offering an appropriate sense of texture, though it can lead to a faintly fuzzy look. Detail is solid throughout, especially in wide shots of the road trip, but some scenes have a comparatively soft look with an occasionally diffuse style. Colors adhere to a natural palette with a few splashes of bold primaries during key scenes -- like a trip down the Vegas strip. Contrast is balanced fairly well, but black levels can look a little crushed in darker scenes resulting in shadow detail that can get a tad murky. The movie's modest style doesn't always lead to the most dynamic presentation, but the picture is respectfully rendered without any unnecessary processing. The audio is presented in an English LPCM mono track. Though this is clearly a dialogue driven affair, the mix gets the job done very well. Speech is clear and balanced throughout with no technical issues -- giving ample voice to all of Brooks' amusing rants. The soundstage itself is notably restrained with minimal yet effective ambience and background sounds (slot machines in Vegas, clatter in an office, etc.). With that said, the score and music selections do open things up nicely every now and then with great range, especially during songs like "New York, New York" and "Born to be Wild." The single-channel track doesn't always have a lot going on, but the limited scope suits the material and the audio is free from any major age-related hiccups. Criterion has put together a small yet solid collection of supplements, including interviews with the cast and crew. All of the special features are presented in 1080p with Dolby Digital sound. Albert Brooks and Robert Weide (HD, 30 min) – This is a 2017 interview with Brooks conducted by filmmaker Robert Weide. Brooks discusses playing a version of himself, his father's career, and his own path toward comedy and filmmaking. Likewise, he elaborates on the movie's production, sharing details about casting and the writing process to round out a worthwhile piece. Julie Hagerty (HD, 11 min) – Here we get a 2017 interview with the actress. Hagerty shares details about her first meeting with Brooks and their working relationship. Herb Nanas (HD, 12 min) – In this piece, we get a 2017 interview with Brooks' manager, Herb Nanas (who also has a cameo in the flick as the Mercedes driver). Nanas discusses his work with Brooks and his other clients like Sylvester Stallone and Roseanne. James L. Brooks (HD,15 min) – This is a 2017 interview with the filmmaker, highlighting his friendship with Albert Brooks and their collaborations. Trailer (HD, 3 min) - The film's trailer is included. Albert Brooks' Lost in America offers a satirical look at happiness and success in the modern world. Through its farcical road trip, the director examines the allure of materialism and the difficulties of "dropping out." On the technical front, the video transfer and audio track both provide a modest yet authentic experience. Though not packed with special features, there are some solid insights to be found in the included interviews. All in all, a very solid package from Criterion. Recommended.